I think it’s safe to say that we lost sight of St. Bonaventure. The Bonnies were the talk of the town back in early January. Bona was tied atop the A-10 standings after having won 4 straight games to open up conference play. However, Bona’s initial success was followed by a 3-game losing streak and subsequently, Bona fell off the map. No one was liking the Bonnies’ chances at an NCAA Tournament bid. Quite frankly, an 88-95 road loss against Duquesne seemed to momentarily bury the team. Without an impressive win on the season, the Bonnies wouldn’t have a chance at an at-large bid in the Big Dance. Without an impressive win, that is, until Wednesday night. St. Bonaventure went on the road to face off against St. Joseph’s, a team that has a legitimate shot at winning the conference title this year. Just like that, the Bonnies grabbed a victory over a team that ranks top 50 in ESPN’s RPI. With a reasonably good record and a road win over a top-tier team, it looks as if the Bonnies deserve some more credit after all. 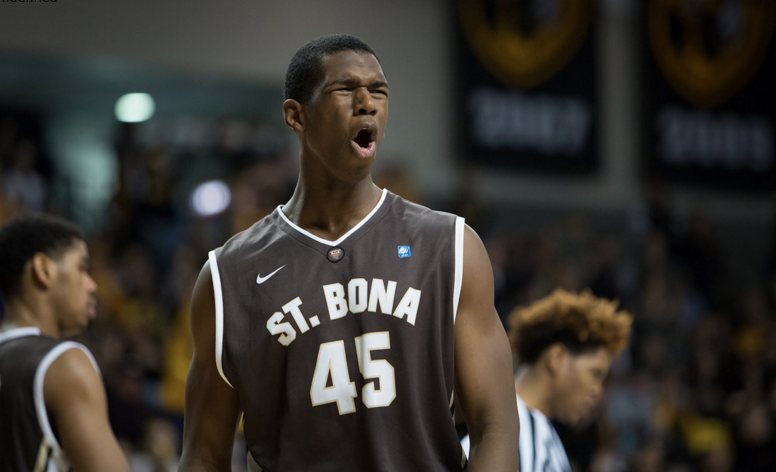 Here are 3 reasons why St. Bonaventure could still make the tourney. I think it’s safe to say that St. Bonaventure may have the easiest schedule remaining out of all the teams in the Atlantic 10. In their final 9 games, the Bonnies play at home 5 times and on the road 4 times. The Bonnies have one tough road game, a matchup against Dayton, but other than that, it looks like they’ll have a legitimate shot at winning the other three. The Bonnies get Fordham, La Salle, and Saint Louis away from home. Those are 3 very winnable games. From here on out, St. Bonaventure also has a fairly reasonable home schedule. The Bonnies have very winnable matchups against Saint Louis, Duquesne, and Massachusetts. In addition, they’ll take on a tough George Washington team and get another go around with St. Joseph’s, both games being played in Olean. It seems safe to say that St. Bonaventure has a very legitimate chance at winning a majority of its remaining conference games. In fact, Kenpom predicts the Bonnies to lose just 1 of these 9 remaining games. If everything goes as projected, the Bonnies very well could be dancing this March. In the Bonnies’ most recent 83-73 road win over St. Joseph’s, Jaylen Adams put on a show. The sophomore guard hit 6 three pointers en route to a 31 point night, leading all scores. In addition, Adams dished out 7 assists and only turned the ball over once. But Jaylen Adams hasn’t been the only one pulling his weight in the Bonnies’ backcourt; Marcus Posley has also been scoring at a high rate in conference play. Adams has been averaging 21.0 points per game in conference play; Posley is slightly above him at 21.6. The Bonnies’ offense has been on fire in A-10 play (82.3 PPG), and these two have been a major reason why. Adams and Posley’s combined scoring efforts have accounted for more than half (51.7%) of the Bonnies’ points in conference play. Their importance to this team can’t be overstated. If St. Bonaventure wants to stay hot towards the end of the season, it’s going to start with the efforts of Jaylen Adams and Marcus Posley. We’ve said it before, and we’re going to say it again: anything can happen in March. The beauty about college basketball is that every conference is guaranteed an automatic bid into the NCAA Tournament. Even if you haven’t won a game all season, you could still make it into the NCAA Tournament by winning your conference championship. Heck, we could see La Salle or George Mason in the NCAA Tournament if something drastic happens in Brooklyn. Even if St. Bonaventure doesn’t have the resume to make it into the tourney via an at-large bid, there’s still a legitimate chance that they win the A-10 Conference Tournament. An offense that can light you up in a hurry is dangerous in March; that’s exactly what the Bonnies have. Even if they don’t find success in their 9 remaining games, they have the potential to pull some upsets and steal a bid. Anything can happen in Brooklyn, and given the sheer talent we’ve seen in St. Bonaventure this season, you can’t count out the Bonnies. The Joes game is a “neutral” site game in Rochester. Although there is a strong Alumni base, it’s not quite the friendly confines of the Reilly Center.